This story also ran in the March 2014 issue of Water & Wastes Digest. Together, AMERICAN Flow Control and AMERICAN Ductile Iron Pipe are providing a complete package of valves, hydrants and pipe for a new waterline to serve the eastern Pennsylvania communities of North Wales and Chalfont Borough. The new waterline will provide a secondary water supply for both the North Wales Water Authority (NWWA) and neighboring North Penn Water Authority from the NWWA’s Forest Park Treatment Plant located in Chalfont Borough, Bucks County. The new line will allow these authorities to better manage the overall flow and storage of their respective systems and enable them to conduct routine maintenance on the existing supply lines. The project is scheduled for completion in spring 2014. The job requires more than 10 miles of AMERICAN ductile iron pipe, as well as 25 large diameter AMERICAN Series 2500 resilient wedge gate valves and 20 American-Darling B-84-B fire hydrants. “The new line was long overdue,” said Raymond “Jay” Berry, director of Operations for the NWWA. Berry said the NWWA was using AMERICAN hydrants and valves when he began working there 26 years ago, and this project marks the first time NWWA used AMERICAN ductile iron pipe. “The majority of hydrants in our system are AMERICAN Flow Control hydrants,” Berry said. “We used the old B-50-B hydrants for many years, and then they got us to switch to the B-84-B. 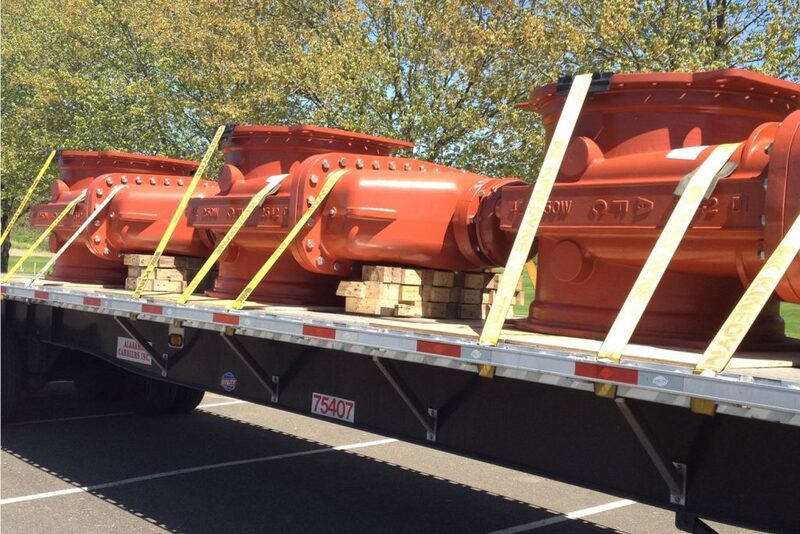 Our AFC hydrants provide the kind of performance and the kind of maintenance history we’re looking for. They are superb products, and I don’t have to stock a variety of hydrant parts. NWWA’s distribution pipelines are mostly iron pipe, with all of its transmission lines being iron pipe. AMERICAN was preferred because of its “superior restrained joint system,” said Berry. “As we have found, cast and ductile iron pipe’s longevity is second to none. AMERICAN supplied Fastite and Flex-Ring ductile iron pipe in 30-, 36- and 42-inch diameters for the Forest Park Transmission Line expansion. Because of heavy traffic in the area, which is near Philadelphia, construction of the waterline involved multiple jack-and-bore procedures to minimize traffic impacts. The project included construction of a number of interconnections into the NWWA’s existing water system, as well as stub-outs to allow for future interconnections. One jack-and-bore involved tunneling 140 feet under a busy main street intersection in downtown Chalfont; another, using 42-inch AMERICAN ductile iron pipe, bored 240 feet under Walnut Street and the Southeastern Pennsylvania Railroad line in New Britain Township; a third involved a 400-foot bore under a recently completed section of Route 202 Parkway in Warrington Township. Work on the project was divided into two contracts. Michael F. Ronca & Sons of Bethlehem, Pa., is general contractor for roughly half the work, and Almeida & Hudak Utility Contractor of Harleysville, Pa., is general contractor for the other half. AMERICAN hydrants and valves were sold by LB Water, which is headquartered in Selinsgrove, Pa., and has eight full-service locations in Pennsylvania, Maryland and Virginia. NWWA has more than 25,000 customers in its service area, which includes seven municipalities in two counties. Capacity at the Forest Park Treatment Plant is 40 MGD, which is shared by NWWA and the North Penn Water Authority. Founded in 1905, AMERICAN is a manufacturer of ductile iron pipe, spiral-welded steel pipe, fire hydrants and valves for the waterworks industry, and electric-resistance-welded steel pipe for the oil and gas industries. AMERICAN’s diversified product line also includes static castings and high performance fire pumps. This article was also featured in WaterOnline. How Does the Reduction of Lead in Drinking Water Act Impact AMERICAN Flow Control Product?